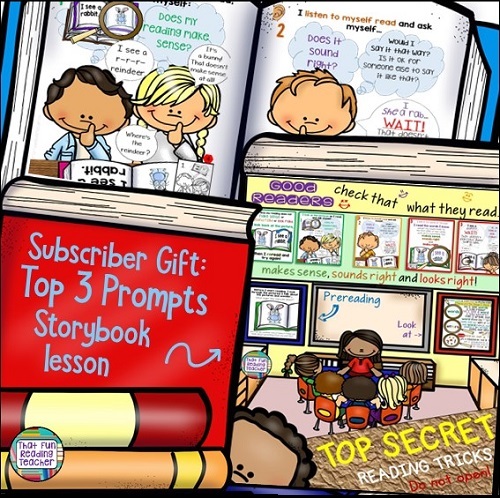 Are you teaching emergent readers the very basics of reading, and overwhelmed by the avalanche of reading prompts to choose from? The following top three prompts were the most emphasized part of our Reading Recovery training, because they form the basis of what good readers naturally do. The founder and creator of the Reading Recovery program, Marie Clay, studied the strategies proficient readers used and learned that children have the most success reading when they use meaning as their primary source of information (ensuring the story made sense), then language structure (how the words sound together, ordered properly in the manner we would use them in speaking the language) and finally the ‘visual information’ (the ‘looking’ at the words, letters, punctuation, etc. part of reading). If something does not make sense, sound right or look right, go back and reread from the beginning of the sentence. It is important to prioritize these in order. Ensuring that a child makes his or her reading makes sense and sounds right should be well-established before switching focus to checking letters or words. By all means model it, but get the first two strategies established first. If these seem to be forgotten when moving on to ‘looking’, drop the focus on looking and go back and refocus for a while. I have just redesigned line art printable bookmarks with visual and contextual examples for each prompt, and a fourth bookmark summarizing all of the prompts together. These were previously color and a subscriber gift. I ran into some complications with my blog, and apologize to those of you who have been waiting for them! I am putting together a new subscriber gift and will keep you all posted. In the meantime, here are the new, easier to access, free bookmarks! Great tips, thanks for the prompts! You’re welcome Heather. They really work, especially when kids know them in order, and well. Thank you so much for commenting.